My blackberry bushes have produced a ton of fruit this year and are so sweet and juicy. I was making dinner yesterday and had biscuits on the menu and realized I was out of honey and didn’t have any jam in the cupboard, so decided to whip up a batch of jam. I have never made jam this way, but thought I could figure it out and it turned out perfectly. I also love the fact that I didn’t have to sterilize a bunch of jars and make a huge mess, like you do when you do canning. 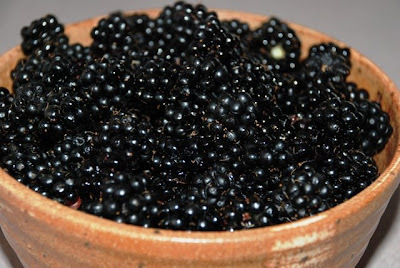 Place the blackberries and sugar in a large saucepan over medium-high heat. 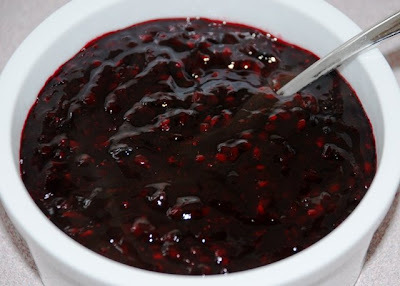 Using a wooden spoon mash up the blackberries and stir constantly until they let out their juices and come to a boil. Continue to cook over medium high heat for 5 minutes, stirring constantly. Next mix the cornstarch with the water, add to the blackberries and stir until thickened. Place the jam in a sealable container and store in the fridge for up to 2 weeks. Oh yum. I make pancakes for my kids every Saturday morning and this would be a perfect topping! Nicely done Jason.